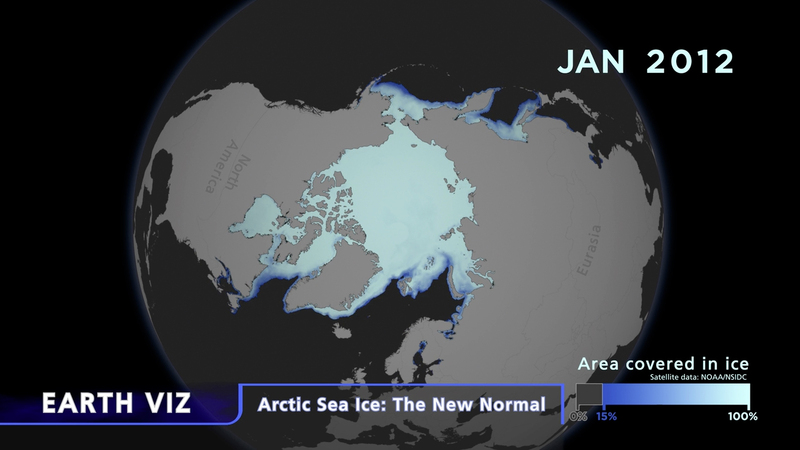 This SOS dataset is a companion to a flat-screen data visualization, Arctic Sea Ice: The New Normal, produced by the American Museum of Natural Historys Science Bulletins program. 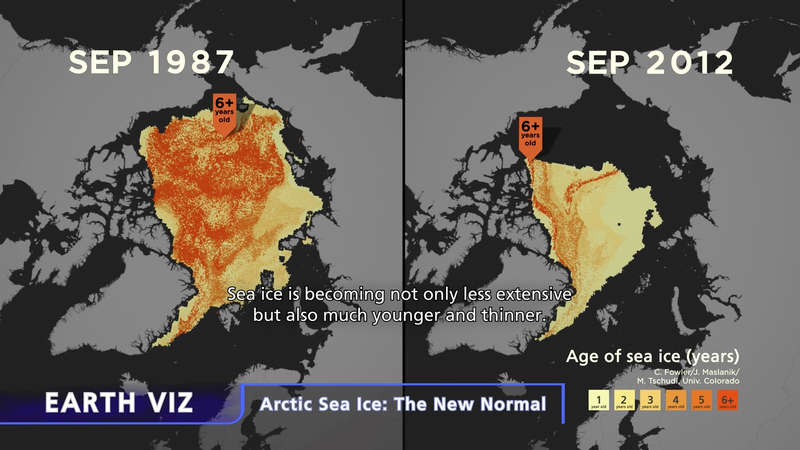 As climate change progresses, the seasonal ice covering the Arctic Ocean is becoming not only less extensive but also much younger and thinner. The radical, recent changes suggest that the Arctic has entered a dramatic new state, which has environmental impacts both locally and globally. This visualization highlights two datasets, described below. Sea ice concentration (Area covered in ice): The blue dataset is the fraction of ocean area that is covered in ice, called sea ice concentration. Concentrations of 15 to 100 percent coverage delineate sea ice extenta standard used to interpret change in sea ice over time. Concentrations under 15 percent indicate sparse ice and do not appear in the visualization. This dataset is collected by passive microwave sensors in the Defense Meteorological Satellite Program and is processed by the National Snow and Ice Data Center. The images for our visualization were provided by the NOAA National Environmental Satellite, Data, and Information Service (NESDIS). Sea ice age: The orange dataset is an estimate of the age of sea ice at a given location. Some sea ice formed only in the last year, called oneyearold ice. Other ice has survived the seasonal melt for multiple years. The observations come from satellite data and drifting buoys, which reveal the formation, movement, persistence, and disappearance of sea ice. This history is then used to estimate age. The dataset is developed by Charles Fowler, James Maslanik, and Mark Tschudi at the Colorado Center for Astrodynamics Research at the University of ColoradoBoulder. The images for our visualization were provided by the NOAA Climate Program Office. The FTP link will lead you to two movies: One is AMNHs flat-screen visualization. The second	the SOS dataset adapts this visualization for Science on a Sphere, but without captions.